TMS Software has released a new version of their TMS Flexcel for VCL & Firemonkey component suite. 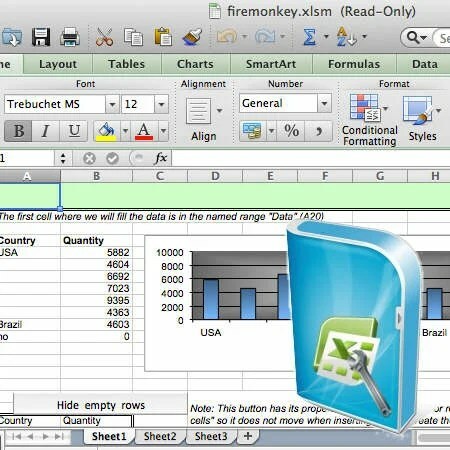 This component suite supports reading and writing Excel files natively in Delphi Firemonkey. It supports .XLS formats for Excel 95 through Excel 2013 and .XLSX/.XLSM formats for Excel 2007 through Excel 2013. Basically if you need to work with Excel files in Firemonkey this looks like the go to component suite to take care of that for you. You can export your Excel files to PDF and to HTML using the component suite. Additionally, it is cross platform and supports Windows, OSX, IOS, and Android. It even supports over 200 Excel formulas. Excel does not need to be installed on the device in order to use this component. One thing I noticed is that it doesn’t seem like the TMS Flexcel component comes with the TMS Component Studio for Firemonkey so it looks like this suite has to be purchased separately as it is a commercial component suite for Delphi XE5 Firemonkey (and some earlier versions). It comes with a full trial so you can test TMS Flexcel out beforehand to make sure it fits your needs.